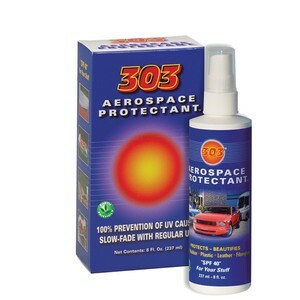 By far one of my favorite products, 303's Aerospace Protectant offers powerful UV screening protection for your colored gel-coat fiberglass, inflatable boats, vinyl, clear vinyl windows, rubber, plastics & leather. All you have to do is spray it on and wipe it dry. After treating your boats surfaces with the 303 Aerospace Protectant they'll repel dirt, soiling, staining, water spots, salt water and mildew. Leaves behind a semi-gloss finish that offers a durable layer of protection for that rich new look. All that and it's non-toxic & environmentally safe!